The following is a slightly edited, long version (I shortened it due to time constraints) of a talk I gave at Berkeley on March 13. I was one of four presenters on a panel on the Ukraine crisis. My charge was to discuss the internal political situation in Ukraine. My Berkeley colleague Yuriy Gorodnichenko (Economics) discussed the economic dimensions of the crisis; Andrei Tsygankov (Political Science, SF State) focused on Russia’s objectives and perspective; and Steve Fish (Berkeley, Political Science) finished up with his take on the long-term implications of the crisis for Russia and the international community. I’ve been asked today to talk about the internal political situation in Ukraine, so that’s what I will do. I’ll start with some background. 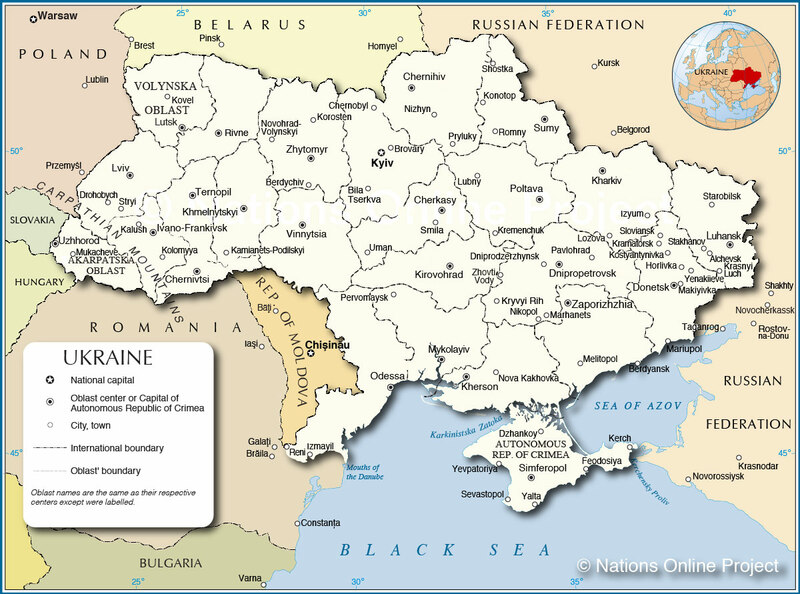 According to its constitution, Ukraine is a unitary state, but like most unitary states it is divided into regions, in this case 24 regions, or oblasts, shown in the first slide (above) by the dotted lines. The constitution also identifies two “special status” cities, the capital, Kyiv, and Sevastopol, in Crimea, which is where the Russian Black Sea Fleet is based. Finally, there is one so-called autonomous region, Crimea, which has an entire chapter devoted to it in the constitution, and which as you doubtless know is currently being occupied by Russian troops. The “ethnic” composition of the population, according to the 2001 census, is shown in the second slide. As you can see, almost 78 percent of the population identified themselves as “Ukrainian,” while 17 percent identified themselves as Russian, which suggests that Ukraine is relatively homogeneous in comparative terms – by way of comparison, ethnic Russians make up about the 81 percent of the population of the Russian Federation. The second largest ethnicity in Ukraine (Russians), however, makes up a larger portion of the total than the second largest group in Russia (Tatars) – 17 percent of Ukrainians are ethnic Russians, whereas only 3.9 percent of Russian citizens are ethnic Tatars. It is also worth noting that there are some two million Ukrainians in Russia, compared to 8.3 million Russians in Ukraine. The next slide shows the distribution of ethnic Russians by oblast. As I am sure you know by now, ethnic Russians are concentrated in Crimea and in the eastern and southern regions of the country. However, only Crimea had a majority Russian population in 2001 – 58.3 percent. But note also the large percentage of Russians in the so-called Donbas oblasts of Donetsk (38.2 percent) and Luhansk (39 percent). These are densely populated, heavy industry regions, in particular coal and steel production. Russians in the Donbas tend to be concentrated in its larger urban areas. In the city of Donetsk, for example, they make up a narrow plurality – 48 percent, compared to 47 percent of Ukrainians. But Ukrainians are an absolute majority in the great majority of smaller cities, towns, and especially rural areas. Donetsk is where the former, now deposed, Ukrainian president, Viktor Yanukovich, is from, and the Donbas was, and to some extent still is, his political stronghold. And there are also significant Russian populations in other eastern and southern oblasts: in Kharkiv oblast, Odesa oblast, Kherson, Dnipropetrovsk, and Mykolaevska oblast. That said, it is important to appreciate that what we typically call “ethnicity” – and what in post-Soviet space is usually referred to as “nationality” – captures only part of a very complex cultural and linguistic story in Ukraine. The next slide gets at part of that complexity by highlighting the difference between ethnicity, on the one hand, and language affiliation on the other. 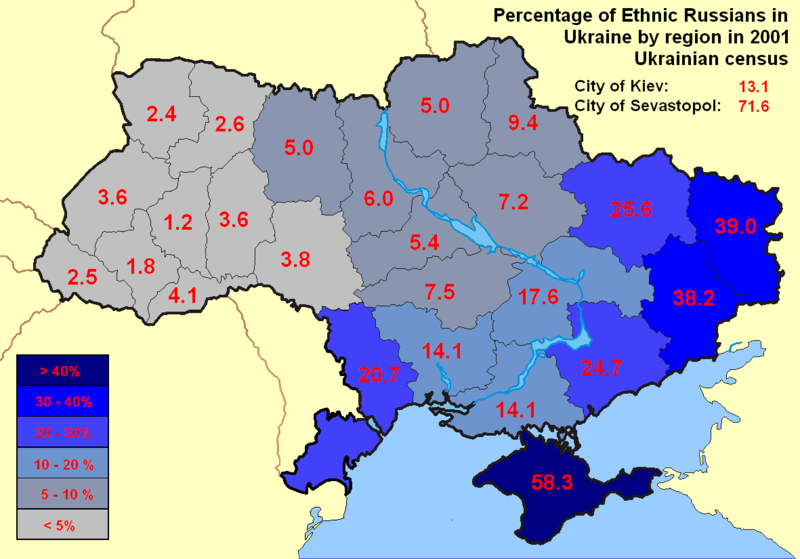 Again the data is from the 2001 census, which asked what respondents considered their “native language.” It shows that almost all ethnic Russians – 96 percent – identified Russian as their “native” language, but only 85% of ethnic Ukrainians identified Ukrainian as theirs – the great bulk of the rest listed Russian. So whereas a significant number of ethnic Ukrainians consider Russian to be their “native language,” there are very few ethnic Russians who consider Ukrainian to be their native language. This “native language” question masks a still more complex reality because it does not get at language use – indeed, the term itself is ambiguous. For example, you can imagine someone taking the position: “I am an ethnic Ukrainian, so my native language is therefore Ukrainian, but I don’t speak it very well or very often.” Which is why there has been a great deal of social science research on actual language use in Ukraine. The next slide starts to dig down into language use by giving the results of a 2004 survey on so-called “home language.” In effect, respondents were asked about the language they speak mostly, or entirely, at home. 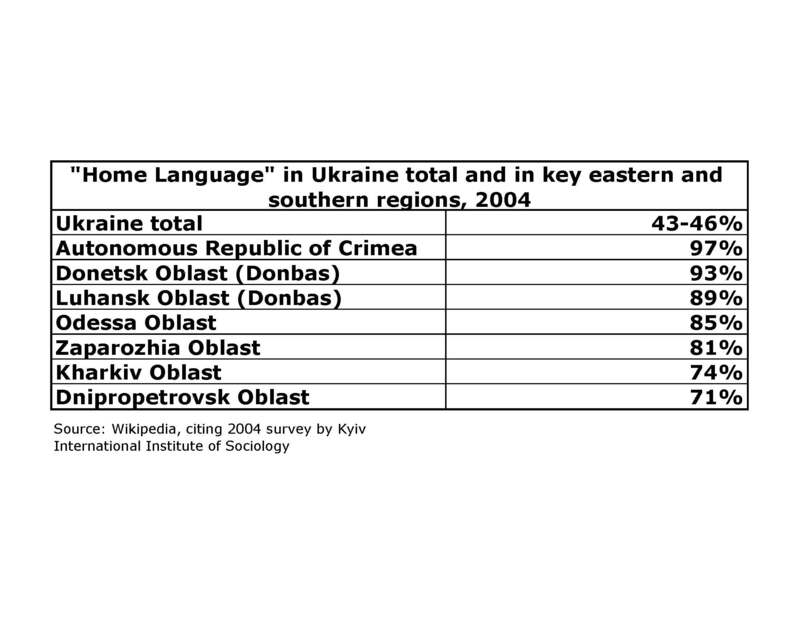 The findings are generally consistent with others I’ve seen, which is that some 40-45 percent of the Ukrainian population considers Russian its “home language.” In Crimea, though, that figure is 97%, and as the slide confirms, you also get high figures for other eastern and southern oblasts as well. These, then, are the so-called “Russian speakers” or “Russophones” in Ukraine. The next slide further complicates the picture. 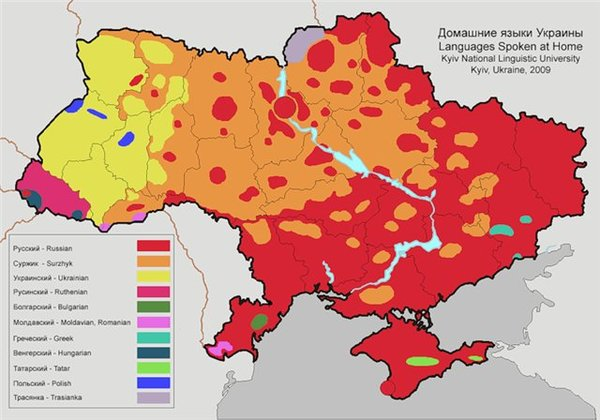 It presents the spatial layout of home language use across the country, the red areas being where Russian is the majority language (mostly in the east and south), yellow being where Ukrainian is mostly spoken (mostly in the West), and orange being where a hybrid of Russian and Ukrainian – “surzhyk” – is widely spoken. I would take this map with a considerable grain of salt because defining where surzhyk blends into Russian or Ukrainian is basically arbitrary. But the point is that as you move from west to east, you go from a zone of mostly Ukrainian speakers, to a central zone of mixed speakers and mixed language, to a southeastern zone of mostly Russian speakers and Russian culture. Yet another complicating factor is that the great majority of Ukraine’s citizens are bilingual. Linguistically, Russian and Ukrainian are close members of the East Slavic language family, which makes it much easier for a Ukrainian to learn Russian, and vice versa, than it is for a Russian to learn, for example, Tatar. It is particularly unusual to find an ethnic Ukrainian who is not fluent in Russian, even in the west, given the incentives and educational requirements during the Soviet period, as well as the prevalence of Russian-language media and television in the country. But bilingualism masks yet a final linguistic complexity, which is how much, and when, bilinguals speak their “second language.” Surveys in Ukraine show a trend toward increased use of Ukrainian-only in the west, and increased use of Russian-only in the east, even though the great majority of people in both parts of the country are bilingual. Finally, a brief word about religious cleavages in Ukraine. The next slide summarizes the results of a survey from 2006. It shows that 62.5 percent of respondents described themselves as non-believers or non-affiliated. Some 27 percent identified as Orthodox, but they are in turn split among those affiliated with the Kyiv Patriarchate (14.9 percent), the Moscow Patriarchate (10.9 percent), and the Ukrainian Autocephalous Church (around one percent). Ukrainian Greek Catholics (or Uniates), together with Roman Catholics, make up about 6 percent of the population. Only around two percent of the population is Jewish, and another two percent is Protestant. For our purposes, what is important is that most Uniates and Roman Catholics are located in the west, and most Orthodox believers affiliated with the Moscow patriarchy are in the east, which reflects and reinforces the country’s cultural west-east divide. So how do these linguistic and cultural differences play out politically? The stark fact is that every Ukrainian election since independence in 1991 – and indeed in the late Soviet period as well – has revealed a geographic divide over political preferences between east and west. This next slide shows the results of the 2010 presidential election, which was won narrowly by Yanukovich. 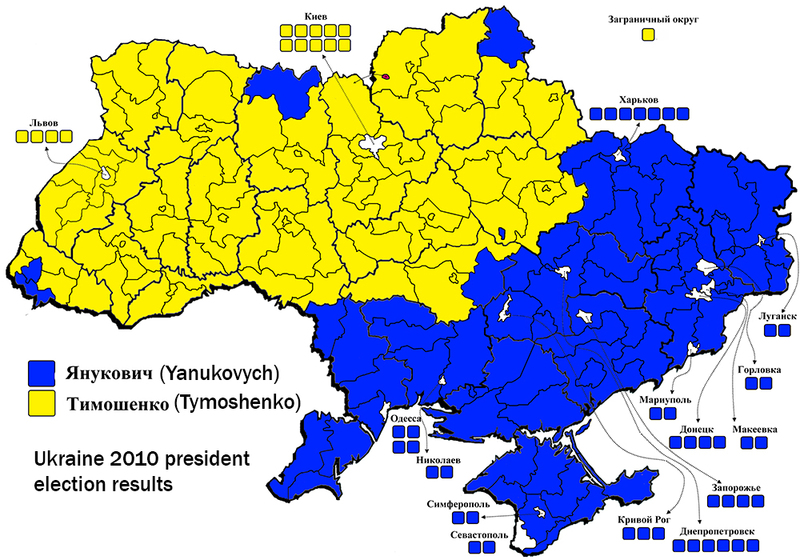 The blue areas went for Yanukovich, who won the east, and the yellow areas voted for Yulia Timoshenko, the former prime minister, who won most of the west but not enough to win the election. That turned out to be a particularly bad outcome for her because she was subsequently jailed by Yanukovich. So what are the balance of political forces in the country today? The next slide gives a picture of the composition of Ukraine’s parliament – the Verkhovnaia Rada – in recent years, with the third panel showing the results of the October 2012 parliamentary elections. That parliament is still the sitting parliament today, despite all the drama. To my knowledge, no member of parliament has been formally expelled and denied parliamentary immunity, although some unknown number of deputies has reportedly fled home or gone abroad, presumably to Russia. Focusing on the last panel, the blue pie slice represents Yanukovich’s Party of Regions. The pink slice represents the Communist Party, which aligned itself after the 2012 elections with Yanukovich. Support from the Communist Party, along with support from some “independents” (in grey), allowed the Party of Regions to form a very narrow parliamentary majority and form a government. It was that government that fell earlier this year – the then-prime minister, Mykola Azarov, resigned on January 28, a little less than a month before Yanukovich fled Kyiv and was then deposed by the Rada. The core of the opposition after the 2012 elections – Yulia Timoshenko’s Batkivshchyna or Fatherland Party – is shown in white. The new party of the former boxing champion Vitaly Klitchko, UDAR, is shown in red. Finally, light blue is the far-right nationalist party, Svoboda, which passed the five percent threshold for parliamentary representation for the first time in 2012, receiving 10.4 percent of the party list vote, with the bulk of its support coming from the west. In my view, Svoboda’s 2012 breakthrough reflected a general polarization of the electorate due to growing dissatisfaction with the status quo, as well as the collapse of a coalition of parties that had supported the former president, Viktor Yushchenko, the one-time “hero” of the so-called Orange Revolution of 2004 who by the end of his first term had become deeply unpopular. The dissatisfaction also helps explain why the Communist Party won more of the party list vote than in the previous election, and more – 13.2 percent – than Svoboda, which allowed it to increase its representation from 25 to 32 deputies. So both the far-right and the far-left did well by historical standards, which is rarely a good sign. What has changed since the fall of Yanukovich? First, the Party of Regions has been greatly weakened and appears to be splintering. It abandoned Yanukovich immediately after he fled, voting to depose him on February 22. The vote was unanimous, with all 328 of deputies who participated voting to remove him on the (constitutionally dubious) grounds that he was unable to fulfill his duties. Polls show that support for the party has since plummeted nationally, although it still has some support in the east. 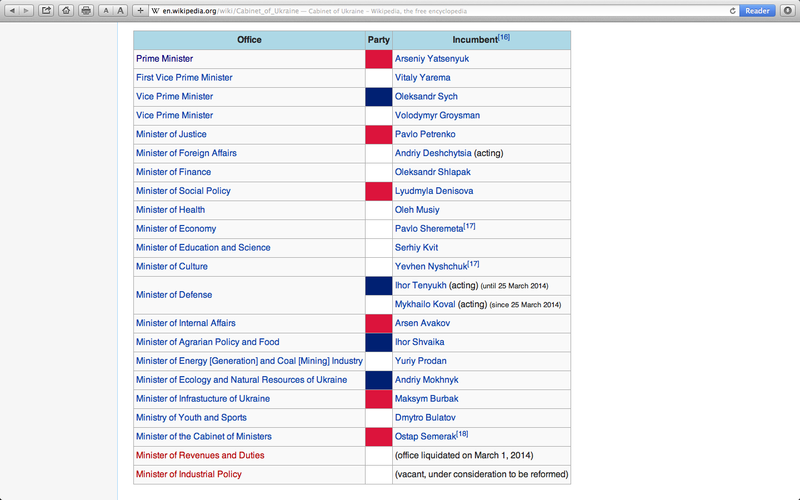 As this suggests, the coalition is not, in fact, very representative of the country as a whole, despite the fact that it describes itself as a “unity government.” There are no representatives from Klitchko’s UDAR party (which announced that it would not participate in a government that included representatives from Svoboda) or from the former governing parties (the Party of Regions and the Communist Party). It is also regionally unbalanced – only two of the twenty ministers come from the east. As a result, a government that was dominated by ministers from the east has given way to one even more dominated by ministers from the west. Not only has that played into the Russian narrative that the government is unrepresentative, but it has also reinforced the fears of Ukrainian citizens in the east, particularly but not only Russian speakers, that the new government does not reflect their interests and concerns. That said, in my view the oft-repeated claim by Moscow that the new leadership in Kyiv is dominated by the far-right and neo-Nazis is false. Svoboda has four of twenty cabinet posts (EWW postscript: now three of twenty), which presumably was payback for the critical role the far-right played in the decisive combat on the Maidan in February. Indeed, it is important to keep in mind that Yatsenyuk and his allies in the leadership of Fatherland would have had an even harder time containing the far-right – and in particular disarming Pravy Sektor – had they kept Svoboda entirely out of the new government. That is true, as well, of any effort by the new government to include one or two representatives from the Party of Regions – the activists from the Maidan, particularly those from its extremist faction, would not have stood for it. But the fact that UDAR refused to join the new government did not help in its effort to reconcile with the public in the east, and neither did its failure to include at least more representatives from the east. But the most important reason why Moscow’s claims ring so hollow is that there is very little public support for the far-right in Ukraine. This slide below gives the result of a recent poll asking about support for possible presidential candidates on May 25. As you can see, Oleh Tyagnibok, the head of Svoboda, was supported by only 3.6 percent of those surveyed, while Dmitro Yarosh, leader of the neo-fascist umbrella organization Pravy Sektor, was polling even worse, at 2.3 percent. And as a political party, Svoboda was supported by only 6.5% of those expecting to vote on May 25 – so less support than it received in the 2012 elections. It is also worth placing the Ukrainian far-right in some comparative perspective. There are politically influential far-right parties in almost all Western countries these days, no doubt thanks at least in part to the lingering fallout of the 2008 financial crisis. Far-right parties are expected to do very well, for example, in the upcoming elections for the European Parliament. There are also neo-Nazi and far-right groups all over Russia, and the far-right LDPR party, with its opera buffa leader Vladimir Zhirinovsky, has been a fixture in Russia’s parliament since 1993. But perhaps most revealing is the comparison with Hungary, where a far-right party, Fidesz-KDNP, won 53 percent of the vote in parliamentary elections in 2010, which under Hungary’s election laws ended up giving it a parliamentary super-majority that allows it to amend the constitution unilaterally. That same year, an even more right-wing party, which is genuinely neo-fascist, Jobbik, won 16.7 percent of the vote. This is not to deny that the far-right and illiberal ethno-nationalism are important factors in Ukrainian politics, particularly in the west. Pravy Sektor in particular, which is full of intolerant extremists, many of them armed, is a major problem for the new government, which has been trying to get them to leave the streets of Kyiv, turn in their weapons, or join the military, with only limited success. But the real problem in Ukraine, in my view, is not that the government is dominated by extremists. Rather, it is that the country is deeply divided, with intolerant extremists on both sides of the Dnieper. Let me say something briefly about Ukraine’s law on state languages, the political issue that has probably been the most controversial and divisive in Ukraine’s post-independence history. Until 2012, language policy was derived from the constitution (which identifies Ukrainian as the state language but also states that “the free development, use and protection of Russian, and other languages of national minorities of Ukraine, is guaranteed”), by international obligations, and by a 1989 language law. Language policies were, however, extremely controversial. Defenders of Ukrainian worry that in a level legal playing field, Ukrainian will gradually give way to Russian, destroying Ukrainian cultural traditions and undermining loyalty to the Ukrainian state. Russian-speakers, on the other hand, want to continue to speak Russian as they have in the past – they do not want to be forced to learn Ukrainian; they want to continue to send their children to Russian-speaking public schools; and they want the right to use Russian in regional and local governments, particularly in areas in the east where Russian is the majority language. The controversy was framed as a dispute over whether Russian should become a “state language” alongside Ukrainian, and as the next slide confirms, it played out along the country’s standard east-west axis. 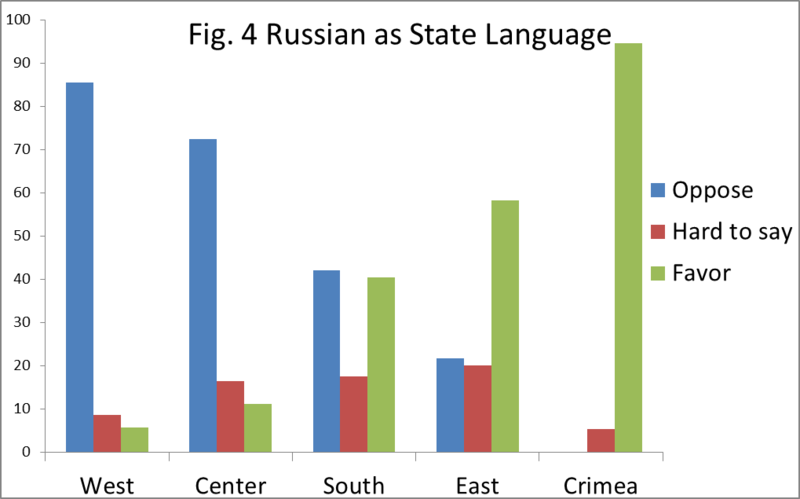 The slide presents results from a 2013 survey asking about support for making Russian a state language. Note that in Crimea, there was virtually unanimous support for it, while in the West opposition is almost as high, with the standard east-to-west gradient in between. The 2012 law was designed as a compromise. Russian, or any other minority language, would be allowed to have the status of a “regional” language in areas where the percentage of a recognized nationality was at least ten percent of the population. Regional languages could then be used in oblast or municipal governments, courts, schools, and so on. After the law came into effect, numerous oblasts and municipalities in the south and east quickly moved to designate Russian as their “regional” language. In what was doubtless the biggest mistake of the post-Yanukovich regime in Kyiv, the Rada voted on February 23, 2014, the day after it removed Yanukovich, to abolish the law, thereby once again making Ukrainian the sole state language at all levels. Fortunately, Turchynov almost immediately announced that he would veto the move, and as a result the law remains in place, although there are still calls to amend it. But again, the attempt played directly into the Moscow narrative that Kyiv is controlled by the far-right. That brings me to the extremely dangerous situation in eastern and southern Ukraine, which is now the main front in this drama. In my view, there is no chance at this point that Putin will allow Crimea to return to Ukrainian sovereignty. Meanwhile, the Kremlin is encouraging and supporting pro-Russian forces in the east and south that are attempting to seize control of regional and city administrations. The next slide shows where pro-Russian activists have been mobilizing and seizing control of the administrative and security service buildings in the east. I believe that the Kremlin is committed, full-bore, to preventing Ukraine from joining the Western institutional orbit, and above all it will not allow it to join NATO if it can possibly help it. The problem is that seizing control of Crimea doesn’t suffice – in fact, it is likely, at least eventually, to make Kyiv push harder for NATO membership, which means that this story is far from over. I suspect Moscow’s program minimum is the permanent destabilization of Ukraine, at least until it gets some kind of commitment on military neutrality. 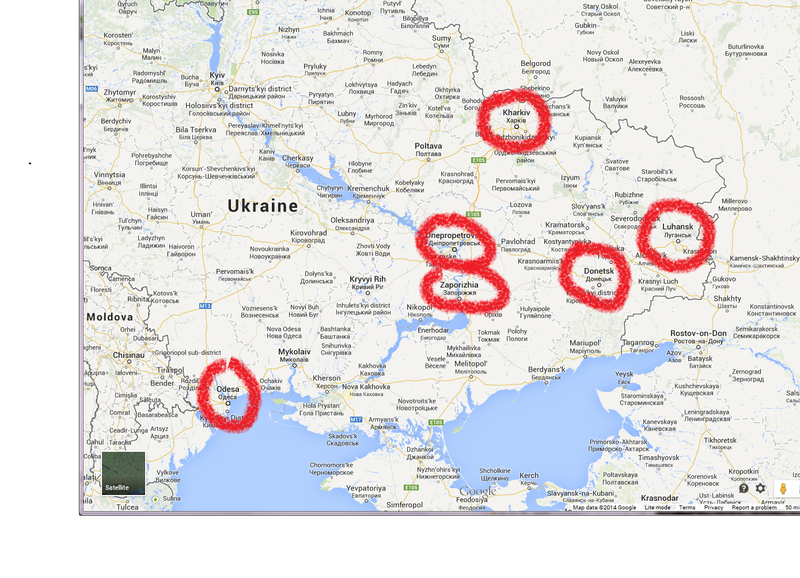 Its program medium is a buffer zone of autonomous statelets in the east and south that come under Russian protection. Its program maximum is the introduction of Russian troops into the east and/or south and military occupation of some unknown part of the country.